One final destination on our marathon vacation.!! Since we needed to fly from Barcelona to London and then home we had to spend a few days in my favorite city with my favorite friends in London! When I first started going to England on business I went to a Jaguar spares day where I met a man selling XK parts. He was friendly and we got to talking. After the event he invited me to come back to his house and meet his family and spend the weekend there. Since that day I have been a regular house guest for 35+ years!! The moral of the story is be careful who you invite to visit! The man I met was Aubrey Finburgh owner of Classic Auto. IF you look in the dictionary under “Eccentric Englishman” my friend Aubrey is there. He is definitely a man that lives life as he sees fit but you won’t find a man with a kinder more generous heart. He is married to one of the most understanding and caring woman I know, Flickie. Another person who would do anything you asked. When I met them they had three children 10, 8, and 5? Now they are all grown with families of their own and have grown up to be just like their parents, wonderful people! Aubrey’s shop is in a small town north of London called Kings Langely. If you ever get near there you must go visit it. It is a relatively small shop that packs an amazing amount of work into it. It is the persona of “Old World Craftsmanship”! I can spend hours there just watching the amazing craftsmen do their work. Their specialty is aluminum body work on very high end rare cars like a C Type Jag, AC , Alfa, Maserati, or Ferrari. They can repair any amount of damage but their specially is actually building entirely new bodies out of aluminum! I have seen them make entire body for a one of 1930s Alfa Romeo including all the trim, grill, and windshield frame. And all this from just from a photograph.!! The first time I went there the shop looked like something from Victorian England. Even the building it is located in is from another era. In the last ten years Aubrey’s youngest son, Nick has started working with him and is slowly taking over the business. He has done amazing things for the business. IT is slowly getting cleaned, organized and modernized. He has added a machine shop, race car prep services, engine building services and now amazing TWO computers including one for CAD CAM manufacturing for one of parts! I highly recommend Classic Auto for any specialty work, or just as a tourist location to see, or a chance to meet a very special man! While we visited with Aubrey and his family they had a couple of dinner parties where we got to see many of his family and friends that we have known for years and had a great time. One evening we met a fascinating friend of Aubrey’s, a women who has worked the last 30 years as a PR specialist for Pink Floyd the rock group and McClaren F1 team. Wow did she have some great stories! We also went one evening to a friends house for dinner. Over the years I have made many, many friends in England and it is great to know so many wonderful people all over the world. I have known this women and her family for about ten years. She is a serious car person so we met through various car events in England. Her name is Collete. Her son Tom visited me in California a couple of months ago and we went out and had a great evening. An amazing young man. I met him when he was 19, and now he is 27 and a Neuro Surgeon! I met the rest of the family and they were all very nice people. Aubrey took us site seeing in London for two days. We saw the British Naval academy and museum, one of the few sites in London I have not seen and we went to the Red Poppy memorial display at the London Tower. Very impressive. 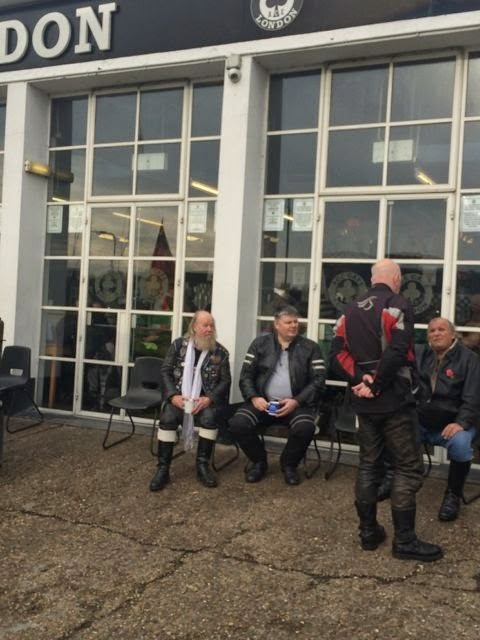 We also went to the London Motorcycle museum. I have been going to London for almost 40 years and have never made it to this one museum so I really enjoyed it. A real old fashion display of great classic British motorcycles. Bonnie and I also spent two days in London walking and shopping. We went antique shopping at Portobello Road, shopping at Harrod’s department store, and Regents St. One day Bonnie and I walked 10 miles across London on a marathon site seeing and shopping event. One thing I can honestly say is after almost 28 years of marriage I still really enjoy my wife’s company so we had two wonderful couple of days alone wandering the streets of London, it doesn’t get any better than that! That finishes off a great vacation! . That’s it until the end of December when I am off on another motorcycle adventure… stories to follow! Aubrey and Bonnie on one of our London tour walks. A visit to Classic Auto and my friend Aubrey Finburgh.. Classic Auto moves into the 21st century with computers… For years Aubrey thought computers were just a passing fad but his son convinced him otherwise..
Building a complete new alloy body for this rare Maserati just from these photos. That is skill! When in London one must go shopping. 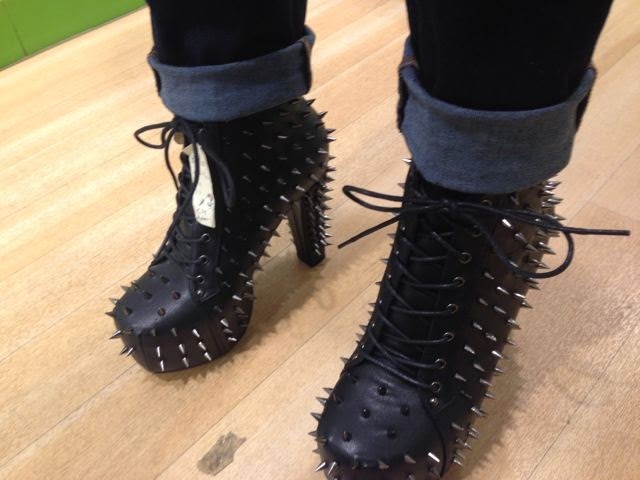 Bonnie get a pair of new shoes.. I think I will be on my best behavior when she wears these! Only in London do you find a Lotus Boutique shop! Doesn’t every clothing shop have a Porsche 919 LeMans car on the floor?? Taking a break from shopping and walking with a glass of wine in Picadilly Circuis. No trip to England is complete without a “healthy” British breakfast…. Stopped in to visit the Queen at Buck Palace.. The shopping is amazing but the prices can be quite shocking! I have taken this exact train into London countless times.. Always a treat. A visit to Burrough’s out door market for lots of treats. 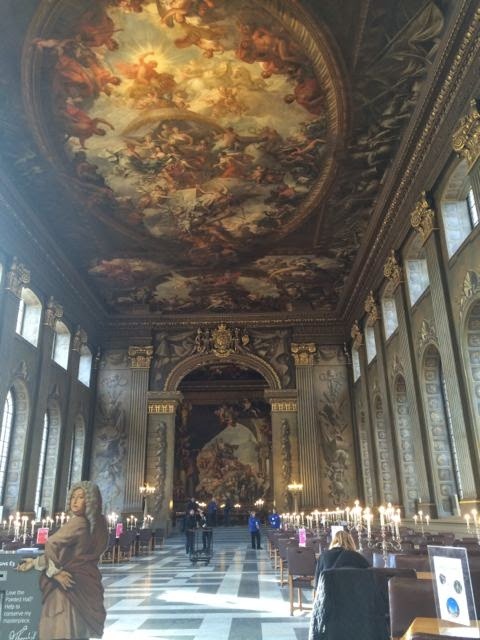 These photos are of the “PAINTED HALL” An event center for formal meetings. What is amazing is most of the details on the walls and ceiling are painted on, not carved..
After walking for hours we took a bit of rest on a river cruise along the Thames through London. London Tower with the Poppy Display as a war memorial..
A great place to go antique shopping.. Antique shopping along Portabello Road. A Lotus Botique, only in London..
Is this really the best name for a musical?? Only in London. A visit to the Ace Cafe! The “Colorful” characters you see at the Ace Cafe..
A tank at the Ace? It was military vehicle day..
What could be more fun than riding with Dad to the Ace Cafe in a tank.. The Triumph room at the London Motorcycle Museum. Shopping in London is fun, even I enjoy it..!! Covent Gardens, a fun place to go in London.. Previous articleHola from Barcalona, Spain!! Every weekend i used to visit this web site, as i wish for enjoyment, for the reason that this this web site conations truly fastidious funny stuff too. If you would like to take much from this post then you have to apply these techniques to your won webpage. some pics to drive the message home a bit, but instead of that, this is great blog. Hi there to all, it’s truly a nice for me to visit this web page, it includes priceless Information. I simply want to say I am newbie to weblog and honestly savored your page. Almost certainly I’m planning to bookmark your blog post . You really have exceptional posts. Regards for revealing your website page. What pro’s don’t seem to be saying around Ataşehir kurye and how it have an effect on you.